Apple is offering to replace millions of European iPhone chargers free-of-charge, warning that the older USB adapters could “overheat and pose a safety risk”. Apple says it will replace a batch of older iPhone chargers free-of-charge for customers after it emerged that they pose an overheating risk. The USB adapters were sold across Europe between October 2009 and September 2012 for the iPhone 3GS, 4 and 4S. 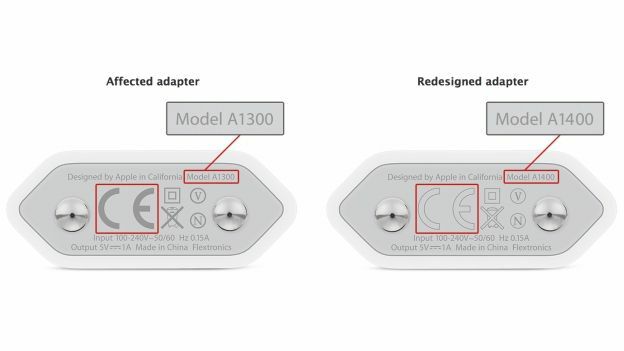 In 2012 Apple realised the issue and replaced it with an almost-identical adapter with model number A1400, although some are still out there and pose a hazard. Thirty seven countries across Europe are affected by the dangerous adapters, although the UK is not on the list. If your one of the unlucky ones, you can get the chargers exchanged at an Apple Retail Store or an Apple Authorized Service Provider. Otherwise you can contact Apple Technical Support to arrange for an exchange. Users who purchased a third-party adaptor to replace one of the chargers in question will also be given a new one for free. If you think that your charger may be one of the feared few, then head over to the Apple website to find out more details.